Ma’adan began as an idea from Stuart Kahan and Yossi Markovic, who have been friends since the second grade. After working separately in the food industry they decided to come together in 1981 to build a glatt kosher take-out store. Choosing Teaneck, NJ as the prime location for their new kosher store, the duo’s winning combination of drive, vision, and love of fine foods paved the way for Ma’adan to open up its doors in 1982. In a short time the small 900 square feet food gourmet store transformed into a 4,500 sq. ft. cornucopia of gourmet foods, wine, and baked goods, with extensive dairy and meat departments. We offer a wide selection of kosher foods to our customers. For over 20 years we have been offering our kosher catering services to Teaneck, the surrounding areas, and nearby NYC. Ma'adan is under the supervision of the Rabbinical Council of Bergen County (R.C.B.C) in New Jersey. 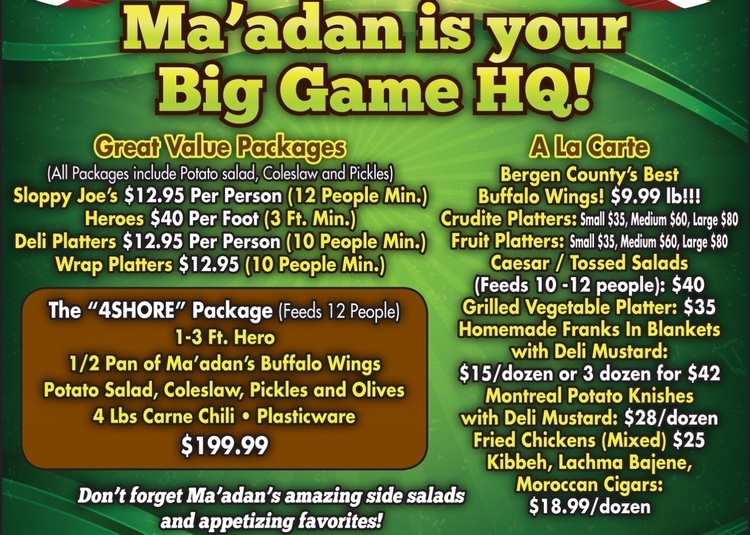 Ma’adan, your Super bowl HQ! Fresh Mozzarella available now at Ma’adan! New at Ma’adan! Hew Hard Salamis! Come in and try a pack: Regular, Chorizo, French and Garlic!